This really is one of Kent’s hidden treasures. 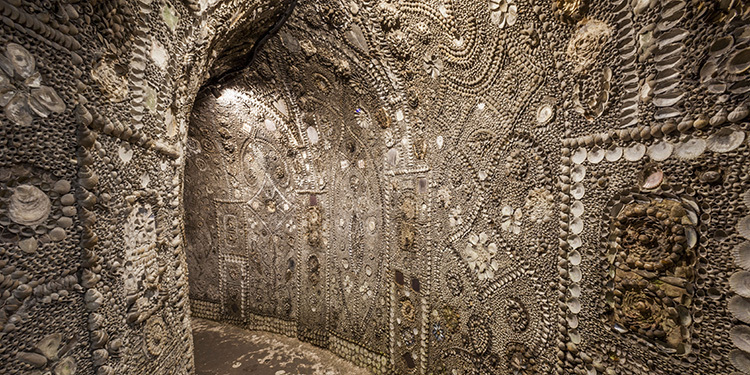 Head to the Shell Grotto in Margate, where you’ll discover 4.6 million shells and 2,000 sq ft of mosaic on 70ft of winding walkways. It’s thought that a young boy discovered the grotto in 1835, and it opened to the public three years later. To this day, despite many theories, no one really knows who created it or what it was used for. The grotto is open every day, including Sundays and Bank Holidays. Thought to have been originally used to store wine due to its steady temperature of 14C all year round, the Surrey caves were sold to Dorking Urban District Council in 1912 and then opened to the public. Visit the museum before taking a tour underground where you’ll be wowed by the intricate cave carvings and calligraphy – the earliest date to be found engraved in the wall of the cave is 1666. Tours can be taken between May and October, and pre-booking is advised. 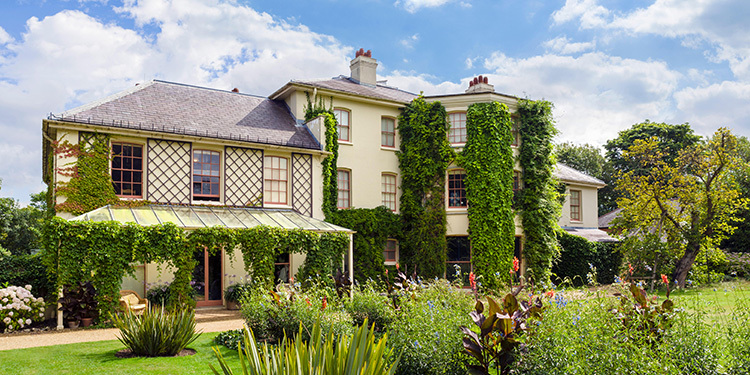 Just 15 miles outside London, Down House was the home to Charles Darwin and is where he wrote his groundbreaking work, On the Origin of Species. The English Heritage property has been fully restored to how it was when Darwin and his family lived there from the 1840s. You can spend hours exploring the house and grounds where Darwin pondered over his world-renowned theories. You’ll be able to take in the woodland area, see manuscript pages from On the Origin and, most notably, the glasshouse where you’ll be able to see just some of the plants Darwin studied. 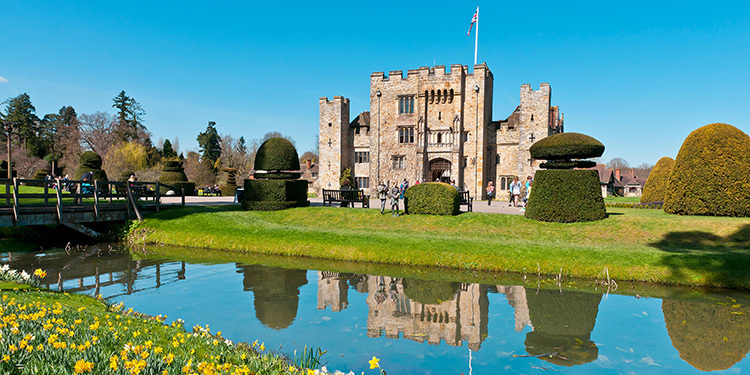 Home to Anne Boleyn, Henry VIII’s second wife, Hever Castle is nestled in the Kent countryside – and a real gem. Head into the double-moated castle, where you can explore the rooms where Anne used to reside, beautifully furnished with tapestry, antique furniture and Tudor paintings. The award-winning gardens are wonderful all year round. Get lost in the maze or enjoy the spectacle of the jousting for a truly Tudor experience. Check the castle’s site for information on jousting tournaments and other events held there. If you fancy doing something a bit different and combining learning with good fun, head to the planetarium. Head to the Star Theatre, where you’ll be able to explore the universe – keep your eye out for comets, eclipses and shooting stars. While there are a lot of educational resources and literature in the surrounding galleries, this is a great day out for all ages. Step back in time to the 17th century where you’ll meet the people of Little Woodham, a charming woodland village. Immerse yourself in the life of the villagers; from embroiderers to sawyers, you’ll experience what it was like to live in a typical 17th-century English village and see the methods and crafts they would have done then, re-created in front of you. The village isn’t open all year round, so check before you visit. If you fancy turning your day trip into an overnight stay with a difference, then Chewton Glen treehouses await. Escape to your very own secluded treetop abode, where you’ll be kept company by the surrounding birds and squirrels. With floor-to-ceiling windows, you’ll be able to enjoy the beautiful panoramic views while you tuck into your breakfast hamper, which is delivered straight to your treehouse. In need of some more road trip inspiration? Take a look at our Inspired British Breaks and get ready to hit the open road.